For those who want to seek challenges then they should be a part of the Polo Cycle Race, either as a participant or as an audience. The cycling race is too rough that some people even say that it is impossible to finish the race. The 151 and 222 km long bumpy stretches starts from Ahmedabad and ends at Polo forest. This adventure packed cycling trail will take one to the dense jungles of Gujarat, hilly terrains, narrow ridges and hike sections. 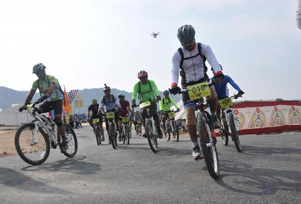 Terrains of the cycling are so thrilling that sometime cyclist will have to pull their bike up and hike the mountains. Also, the cyclist will have to cross a section where the majority of plantations comprise marshy plants including cactus. Cherry on the cake is the fact that the area around the cycling trail is quite prone to bear attack. One can have an encounter with venomous snakes and many other animals as well. Participants who complete the race are awarded with cash prize.